The Rookie’s Guide to Guns and Shooting, Handgun Edition helps new shooters become confident and safe by educating in a fun and humorous way. It’s available free from Amazon.com Tuesday, July 9th and Wednesday, July 10th. Let’s face it. If people are new to shooting, or just haven’t immersed themselves in the gun culture, guns and shooting can be intimidating. Loud noises, armed people and gun stores can be scary. Never fear! The Rookie’s Guide to Guns and Shooting, Handgun Edition will make new shooters comfortable, knowledgeable and safe in no time. And readers will have a few laughs in the process. Go to any shooting range and observe what happens when folks show up without knowing the first thing about their new gun. The Rookie’s Guide to Guns and Shooting, Handgun Edition teaches the basics of visiting ranges and gun stores and helps with introductory shooting instruction. If you watch shooting shows on TV, you might hear someone mention a teacup grip. Just to be clear, this is not a compliment or indicator of social refinement. It’s an observation of poor shooting form. The editors at MyGunCulture.com have painstakingly documented successes and failures observed over the years. They’ve listened to so many gun show huckster sales pitches that the late Billy Mays would be impressed. And the result? The Rookie’s Guide to Guns and Shooting, Handgun Edition. Loaded with pictures and comedic illustrations, this book will tells just about everything one needs to know to get started with the shooting sports. It also addresses mysterious gun terminology and those shooting myths that spread like the flu on a budget cruise ship. 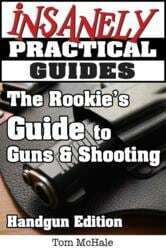 The Rookie’s Guide to Guns and Shooting, Handgun Edition is available now at Amazon.com.